1. What made you decide to take up turning full-time? My Father ran a woodturning supplies shop since retiring from the family run sawmill, so when we finally shut the mill it seemed a logical step to take up woodturning. However, it was the need to make a living rather than a desperate need to make shavings that was the main factor in this decision. I soon realised that the only way to make real money was from producing what other people wanted, so the production work route was taken. I had to become a realist instead of an optimist if food was going to be put on the table. 2. What aspect of turning do you most enjoy? I particularly love making large runs of things - something that I can really get my teeth into. Give me a pile of wood, turn the radio on, and off I go! 3. What three pieces of machinery in your workshop could you not do without? Although I have six lathes in the workshop, my large Oneway lathe is the most important, I can turn 9 1/2ft between centres, and 4ft diameter on the outboard side. I pick up a lot of work that other local turners can't undertake because it's too big for them. I have 15 chucks - I don't like changing jaws - and when I teach groups of students, they don't have to wait for me to get the right jaws on the chuck for them. Lastly, I have my Gary Rance copying fingers, which are absolutely invaluable for production work - just keep removing wood until the finger drops, and then it's the right diameter. 4. Which turners inspire you? There are a few turners that have helped me along the way. Firstly, Stuart Mortimer - the man with the biggest heart in turning - always there to help and support. Also, Gary Rance for his technical ability, I am yet to see anyone better at production work. 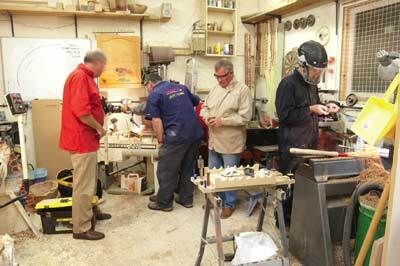 Jimmy Clewes for his brilliant demonstrating and teaching skills, and I wouldn't leave out Nick Agar - the woodturning innovator - he has so many ideas and directions that he wants to go in, and I consider him my woodturning brother. And finally, Mike Mahoney, for being such a nice bloke. Probably what I am doing now: teaching, demonstrating and production work. To do more gallery style work is always a dream, but then I was saying that five years ago! 6. 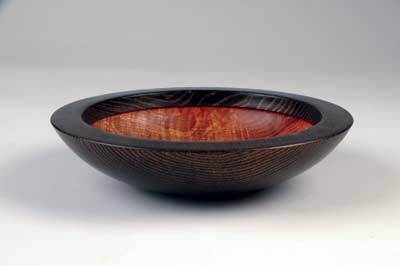 Apart from woodturning, what are your other hobbies and interests? My customers would probably tell you I'm a full-time fisherman, golfer and part-time turner; I love being outdoors away from the mess, and especially away from the dust. 7. 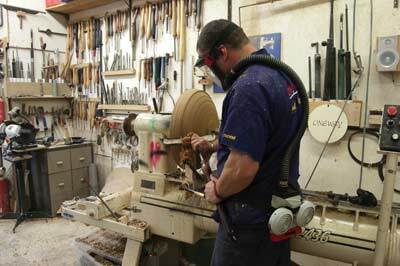 What do you think the future holds for woodturning? I think woodturning as a hobby will always be quite steady. The drive to get teenagers involved is great, even though they will probably not stick at it throughout their teen years once university and jobs get in the way, but hopefully they will come back to it in the future. We are already seeing a push towards work that is coloured, textured and carved - will woodturning become a wood decorating hobby? I'd like to think that we will not sideline the turning techniques that define our craft. 8. Tell us about the piece you are currently working on. 9. Do you have plans to make any more DVDs? My first DVD was a success and I thoroughly enjoyed the whole experience, and I hope that has come over in the film. It did cost me a lot of money so the next one will be done slightly differently. I think the market for instructional DVDs has changed with the format becoming more available to everyone - you have to do something out of the ordinary to stand out nowadays. 10. Tell us about the book you are currently reading? 11. Describe the view from your workshop. My workshop is on a local farm and is situated in the old dairy. It's very idyllic. I used to work from home but I now like the fact that I leave home and go to work - it's almost like having a proper job! 12. How would you describe your style of work? I like to be effective with my tooling. I am sure that being inherently lazy has made me become quicker at turning, as I always look for the easiest way of doing something. So I would like to describe my work as quickly well made, but hopefully not rushed. 13. The pieces you create are typically quite varied, what type of vessels do you most like to turn? 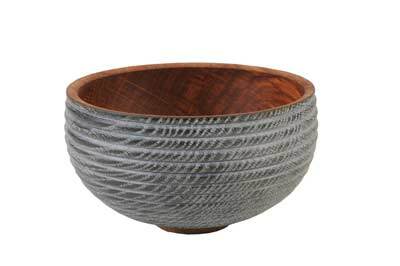 I have always liked the bowl form, which demonstrate function and beauty combined. I like to give my work the impression of a use - the bowl form does that perfectly - even though the customer will probably never use it, this idea makes them feel more comfortable with the purchase. As I have said before, commercialism has to run alongside creativity in my world.